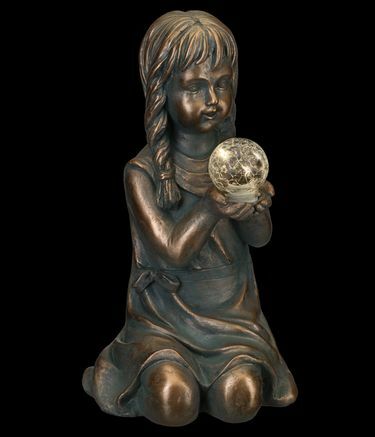 Help your garden glow with our precious new Solar Girl Garden Statue! As she watches over your flowers and plants during the day, this garden girl statue will be fully charged by the sun thanks to her discrete solar panel. At dusk, the auto sensor automatically illuminates her globe, making your yard feel like a magical fairy garden. This high quality statuary is cast using a magnesium oxide formula which is durable and lightweight for shipping. Each piece is hand-painted with a unique and stylish weather resistant finish.